ON THURSDAY, JANUARY 4TH, THE DEPARTMENT OF THE INTERIOR RELEASED A PLAN TO OPEN UP OUR COASTS TO OFFSHORE DRILLING, INCLUDING THE MIAMI AREA. Join Life Is Art, Oceana and many organizations for a fun family event to learn more about the situation and how you can help prevent it from happening. Held under the clear blue sky in a beautiful oceanside setting of the Surfcomber Miami Beach, CoastFest, is a family friendly music and art festival featuring incredible local talent, elected officials, organizations, and businesses. 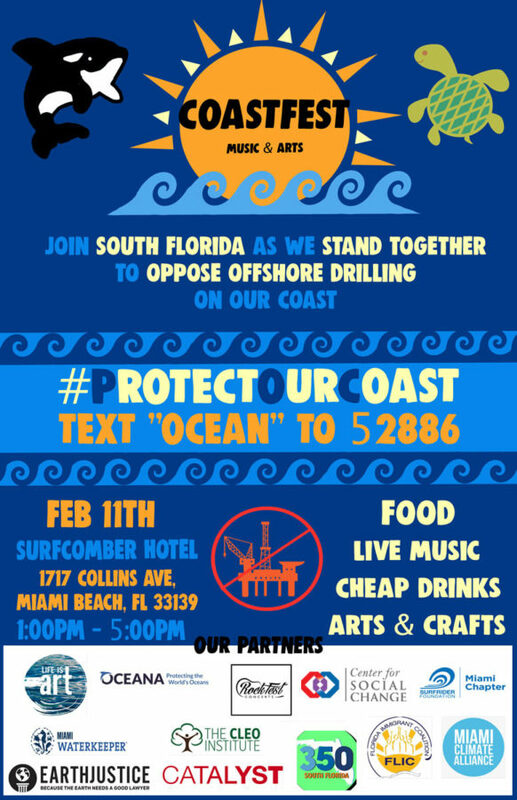 CoastFest brings residents from all over South Florida to stand together to #ProtectOurCoast from OFFSHORE DRILLING and SEISMIC AIRGUN BLASTING. On Thursday, January 4th, the Department of Interior (DOI) released their plan to lease nearly all US water to offshore drilling. INCLUDING off the coast of Broward, Miami and the FL Keys, in the Straits of Florida. We only have 60 days (from Jan 4th) to submit Public Comments to the DOI to show strong opposition. We cannot let oil and gas companies to begin offshore drilling off the coast of Miami. Join South Florida in this fun family event while becoming engaged, and networking with other inspired and motivated residents willing to stand up for our oceans. Enjoy Art, Music, Culture, Food, Drinks, and words from our incredible speakers. Youth arts activities hosted by Artist & Craftsman Supply. A special thank you to Center for Social Change for their amazing support. Want to take action sooner? Send in your public comment to BOEM here.